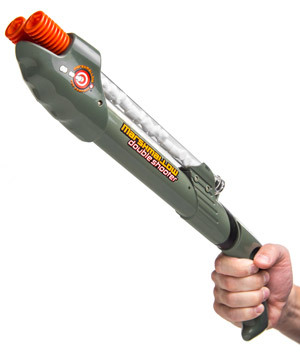 Marshmallow Shotgun: Double-barreled pump-action shooter. 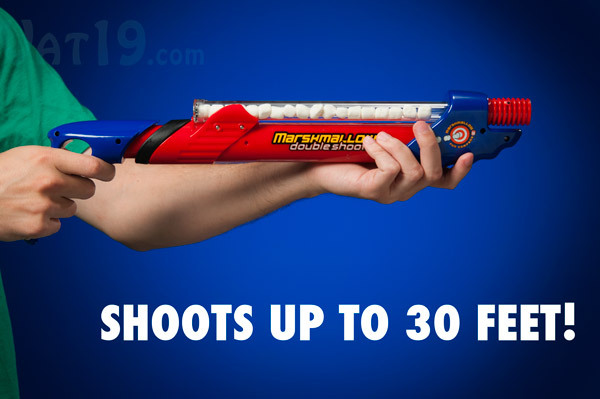 Shoot mini-marshmallows up to 30 feet. Double-barreled shotguns are awesome... except you can't use them on your friends more than once. However, with one minor modification (swapping shotgun shells with mini marshmallows), all of your problems are solved! 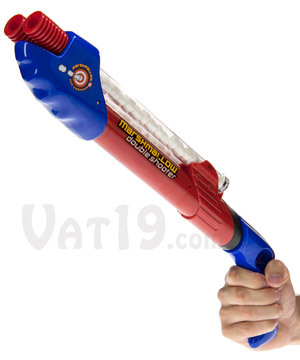 With the Marshmallow Double Shooter, you get all of the double-barreled pump-action without any of the death, dismemberment, and jail time. Take out your enemies from up to 30 feet away, or sneak up close - your ammunition is super soft, so no fear of taking out an eye! 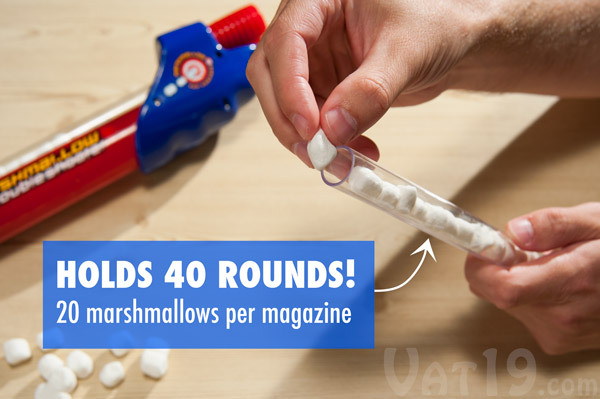 Store up to 20 delicious mini-marshmallows per magazine (for a total ammo capacity of 40). Ammo holders are top rack dishwasher safe for easy cleaning. Dimensions: 20" x 3" x 6"
Weaponry that uses mini marshmallows as its ammo is brilliant for two awesome reasons! One, your super-sneaky ninja skills are fully rewarded because point-blank shots to the dome won't take out an eye. Two, you can grab a nice snack while reloading. With the Marshmallow Double Shooter, you can quickly load and fire mini marshmallows up to 30 feet without requiring any batteries. 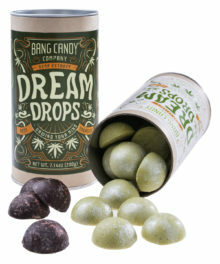 Take out an entire office without all of those pesky 911 calls AND enjoy a nice snack afterwards. Bonus! The Double-Barreled Marshmallow Shooter fires mini marshmallows up to 30 feet. Censure your enemies from up to 30 feet. 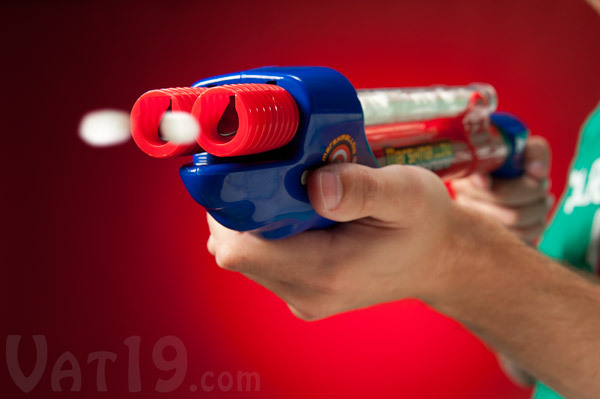 To shoot the Marshmallow Double Shooter, simply pull the grip backwards and then push it forward. Continue this action every time you wish to rain fire (the soft, sugary, gelatinous kind) upon thine foes. 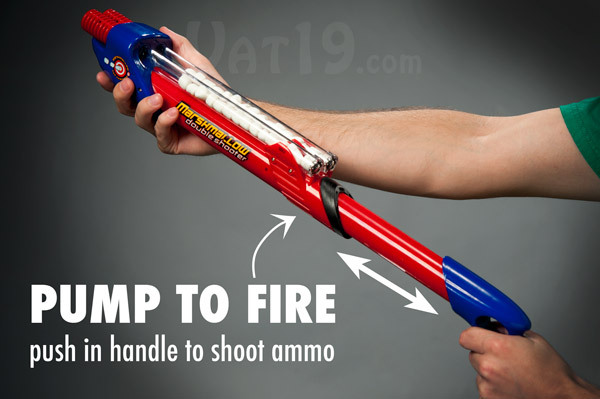 Simply pull back the grip and then push it forward to shoot both barrels of your Marshmallow Double Shooter. Each of the Double Shooter's magazines holds about 20 mini marshmallows. Load them (flat side down), lock 'em in place, and start firing! Each mag holds about 20 mini marshmallows, giving you 40 rounds to shoot before a reload. Who said war couldn't be fun? 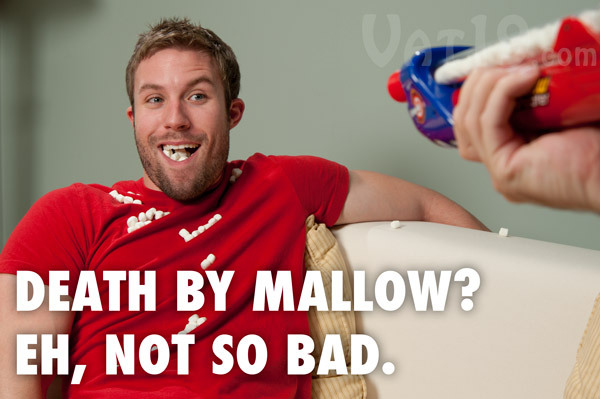 When your ammo is delicious, there's nothing better than an all-out marshmallow war! Roommate ambushes you with a mini-marshmallow assault? No biggie. 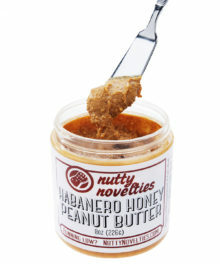 Clean up the mess AND have a snack at the same time. 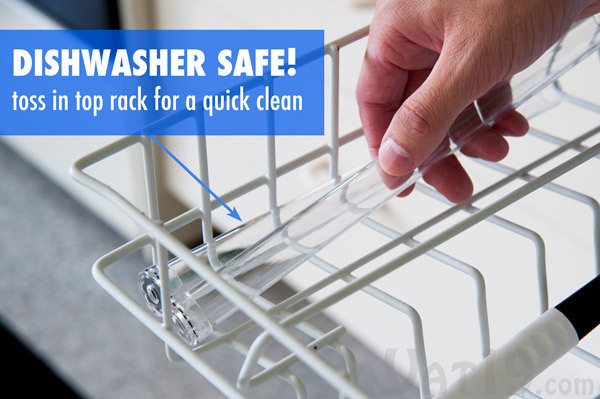 Should your magazines become a tad grimy, simply toss them in the top rack of your dishwasher for a quick clean. The plastic (food safe, of course!) magazines are top rack dishwasher safe. 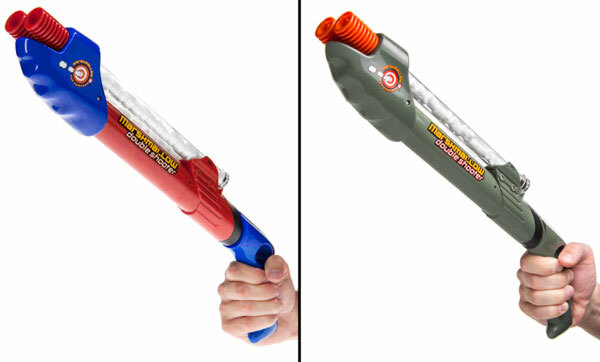 The ultra-cool Marshmallow Double Shooter is available in two color configurations: red & blue and camouflage. 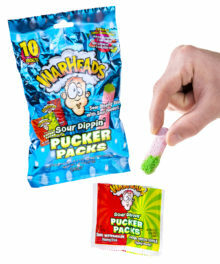 Question: Do you really advocate eating marshmallows that have been on the floor? Answer: Sure. Depends on how dirty your floor is. Also, what stops you from catching your enemy's barrage with your hands, eating a few, and then reloading the rest? Exactly! Oh, and don't forget the five second rule. Keep your head on a swivel! Question: How fast does it shoot? 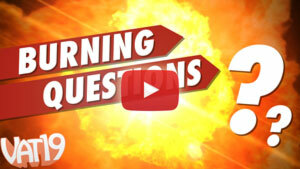 Answer: As fast as you can pump the Double Shooter. In our tests, you can easily fire off two rounds per second. Question: Can I use other ammo other than mini marshmallows? Answer: We are legally bound to say, "no". 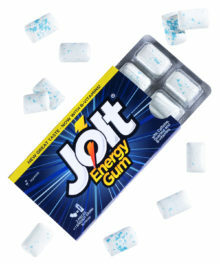 However, will mini marshmallow police show up at your house if you use something approximately the same size and weight? Not likely. Those officers are still busy with all the paperwork from that Stay Puft incident a few decades ago.